Every parent wants to create a great hockey experience for their child, one that leaves them with wonderful memories and an expanded skill set. But how, exactly, does a parent help create that kind of experience? 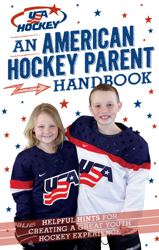 We built the American Hockey Parent Handbook to answer that question, along with almost every other question that hockey parents might encounter. It’s a blueprint for making youth hockey great. Click here to access the digital version.